What if your words gave you immortal life? 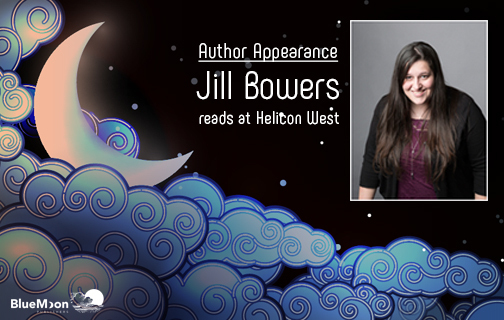 For those who were unable to attend Jill Bowers’ reading at Utah’s premier literary reading series, Helicon West, we’ve included some video clips which capture this fantastic literary moment! Jill explained the concept of her book series and handed out bookmarks for her upcoming novel, Immortal Writers, which launches in Fall 2016. She also read from her favourite dragon battle where Liz, travelling with her hero, Curtis, the sorceress, Healer, and sidekick, Rob, is underwater in a magical shield heading to a secret pool that will endow them with power so they can defeat the evil dragon lord, Kenric. Following the reading, Jill answered questions from the audience along with author Bethany Zohner. Jill’s reading was met by an engaged crowd of 100 people and was also featured on the “Book” sounds like “Freedom” in Spanish blog on the Helicon West site. Along with offering insights into the main characters, especially Liz, who has learned magic and has been taught how to slay dragons, Jill also answered a series of questions that included writing tips, and what other immortal writers, such as Shakespeare, Tolkien, and Hemingway, will appear in her upcoming novel and any other books in the series. Jill also shared her goals of visiting schools and promoting literacy. Click on the link below to see the entire Q&A. What intrigues you about Jill’s reading of Immortal Writers?